The BBC’s betting expert has noted that a “huge” inflow of money has catapulted David Cameron from 8-1 to 10-3 (equal second favourite) since his speech of yesterday. Liam Fox (14-1) had to work hard to neutralise ‘the Cameron surge’ and win that essential second-placed spot. His speech began with a joke about how he played tennis with David Cameron and often lost. He didn’t intend to make losing against Mr Cameron a habit, he laughed! Dr Fox occasionally charmed the audience with his wide smile but this was a serious speech overall – designed to reassure those who MPs who wonder if he is substantial enough to be a potential Prime Minister. It was a very Eurosceptic speech and he won loud applause for his commitment to take Tory MEPs out of the EPP (although the loudest claps greeted his pledge to fly the Union flag outside of schools). He rejected the ‘union’ destination of ‘ever closer union’ and called for a more decentralised and deregulated EU. He told a moving story about the suffering of the Karen people in Burma and said that Conservatives should never look the other way when human beings were struggling for democracy, human rights or free and fair trade. He was unapologetic about his support for the Iraq war and asked the war’s opponents to explain how the world could possibly be a better, safer place if Saddam had still been in power. Near the end of his speech Dr Fox emphasised the problems of domestic violence and the inadequate care of people with mental health problems. Both are dimensions of the ‘extra mile compassion’ that has characterised the ‘broken society’ theme of his campaign. Near the end of his speech he outlined a little of his autobiography but – in what will be interpreted as a dig against David Davis – he said that this race was not about where you came from but where you were going. He concluded by saying that the Conservative Party must be a hopeful party – committed to healing the broken society and restoring national pride. 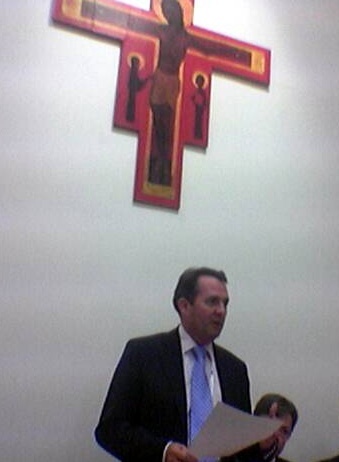 I am very glad that Liam Fox spotlighted human rights in his speech. I heard him address the subject at a fringe meeting, convened last night by Gary Streeter MP. It was one of the most exciting fringe events I have attended in many years of conference-going. Dr Fox (pictured at the fringe meeting) promised to put a concern for freedom and human rights at the heart of Tory foreign policy. He spoke movingly about suffering in Burma. He questioned the moral legitimacy of the United Nations and the way that repressive regimes often dominate its proceedings. He spoke with authority about China and the danger posed to its future stability by water shortages and the consequences of its one child policy (often enforced by horrendous sterilisation procedures). Ben Rogers, a regular contributor to the Platform section of this blog and a human rights campaigner, spoke after Dr Fox. Dictatorships do not make reliable partners – in commerce or politics - Ben argued. He reminded the meeting that our nation is described as The Mother Of The Free in Land Of Hope And Glory. He urged the Conservative Party to build a Britain that nurtures freedom throughout the world for oppressed people. James Mawdsley, who was imprisoned in Burma for his campaigning, addressed the meeting about North Korea, which he had just visited. He described horrific human rights abuses in that country and moved a number of the audience to tears. Michael Gove MP, who also spoke at the meeting, said that Tory Governments must never give comfort to authoritarian regimes again. He ridiculed the Tory party’s post-1997 opposition to Labour’s idea of an ethical foreign policy. The Tories need their own (superior) ethical foreign policy, he said, and that should include rejection of ‘my sonofabitch’ realpolitiks. He highlighted Britain’s all-too-close relationship with Saudi Arabia and said that it export of extremist Wahhabi thinking had gone unchallenged for far too long. Mr Gove paid handsome tribute to Dr Fox for putting idealism back at the heart of Conservative foreign policy. The team that Dr Fox is assembling on human rights – and the agenda that is building – is a huge credit to his time as Shadow Foreign Secretary. I have loved hearing the contenders doing their speeches - the different styles and different focuses - but I have to ask the question what overall effect will they have. My view is that it may effect who comes in second place and therefore put to the membership. Its at that point that the speeches may be forgotten and the members will be inundated with mass mailing etc. Any thoughts?? This is one of the few oppurtunities that ordinary party members will have the chance to see the candidates in action.They will also be subject to the 'spin' put on these speeches by TV and the press.Therefore any views the members have will be significantly reinforced/challenged by these speeches. MPs if they have any sense will vote for that person they think can lead us to victory,but do some of them have any sense? Yes Mr Cash I mean you! Fox was obviously playing for the Cornerstone votes, he must realise that he can't make the final two without them... unfortunately that meant filling his speech with right-wing trivalities. Perhaps we should leave the EPP, but how many voters even know what the EPP is...? but how many voters even know what the EPP is...? Voters aren't the target audience for leadership contenders. The party membership and MPs are. A lot more of them will have been impressed by the wide ranging contents and confident delivery, than were hung up on four lines about the European Parliament. I thought it was a damned good speech, that typically for Liam reached well outside the usual comfort zone of Conservative politics. No simple focus on law 'n order here. An intellegent man, a good speech and a powerful performer. But what would voters make of him? I really don't think Fox's vision is the right one if we're going to concentrate on winning the next election. Whilst I support Dr. Fox's views on family values, and his speech was very good and brought out a number of issues such as mental health which deserved be pushed to the fore, his European policy appears somewhat short-sighted. He seems to advocate a policy that is as pro-American as the Europhile wing of the party is pro-EU. This could ultimately be counterproductive (Euroscepticts becoming branded as removing power from Brussels to give it to Washington). Not my belief - but the possibility exists... especially given Labour spin. His pro-US policy will work so long as the neo-cons are in the White House, but if a Democrat with completely different views (i.e. Hillary Clinton) becomes President, Fox risks isolating Britain. I don't see that as an issue at all, James. Atlanticism is working with the US as partner, whoever the current administration is (remember that even Democrats are in many ways to the right of COnservatives). That's not putting us in hock to the US, as we are to the EU, because it isn't a matter of sovereignty. Far from it. What Dr Fox was arguing for was a non-integrationist and pro-market approact to foreign policy. If a Democrat president decides to break the Special Relationship, it won't be because of any Tory being friendly to America, but because of a decisive shift in American foreign policy towards hemispherism or worse, isolationism. This is highly unlikely in any event. Democrats will probably only win the White House by being strong on terrorism, as Sen. Clinton has depicted herself as being. A President Clinton 44 would continue to need British support. I thought it was a good speech.I've only read it so have no idea whether it was delivered well or not. But it again concentrated on what is bad about our country 'the broken society' or what is bad about our world 'Burma' etc. Sadly speeches like this will I think not capture the imagination of the activists or the electorate as a whole.People seem to want the optimism of the Cameron or Clarke speeches.It will be interesting to see if it boosts Liams chances.Personally I don't think it will. Liam Fox's policy emphasis on human rights and social need, will have enormous appeal to floating voters who seek moral good for their election choice. This will also attract votes from previously Labour and Liberal Democrats. Here is the election winner the conservatives need. Iain is partially correct. Democrats will likely win the White House only if they APPEAR to be strong against terrorism. However, in practice a President Clinton 44 will act like President Clinton 42, with an anti-terrorism "policy" of bombing aspirin factories and vacant office buildings--all show, no substance. To President Clinton 44, British support won't be needed because the U.S. won't be doing anything much that needs British support. In other words, Clinton 44 won't reject the "special relationship" with Britain so much as she will consider Britain irrelevant. As I was coming home 5 Live listeners were calling in there disagreements with Liam's stick a flag outside each school idea. I am surprised he didn't ditch that idea. His problem now is that his strong points on human rights, domestic violence etc. are being somewhat ignored for a discussion on a silly idea of flying a flag outside every school. A misjudgement by Dr Fox. Anyone who thought Fox's speech was good, turn on your radio or television (any channel, any frequency) and listen to which excerpts they are running. You might agree that we should leave the EPP and that we should fly the flag outside schools - I have some sympathy with the former and agree with the latter. Are these people's priorities, though? Fox had a once-in-a-lifetime opportunity to address Conference in the middle of a leadership race, and to talk about the EPP and the flag *at all* is gross pandering to the hard-right and cringeworthy to the watching public. Absolutely AnotherNick, he should have realised which bits of the speech would be picked up by the media. Gross misjudgement, unbefitting of a leader. The flag suggestion is a nice idea. I like the way in America the flag is flown so proudly, but this idea would cost/waste a lot of money, Labour would have a field day and it couldn't be implimented equally either, Wales & Scotland would have to fly their flags too, in fact I'm not sure the majority of English people wouldn't prefer the English flag (which has become more popular recently) and what about Northern Ireland. Dr Fox has a lot to offer the debate, especially on certain subjects - health, domestic violence, human rights, but I feel he is well behind Cameron now. The stats suggest Ken Clarke is up against it too, but I'm not sure about that yet. I believe that on the Europe issue, most people would subscribe to the advantages of the EU as a free trading bloc but are against further integration and ceding further control to Brussels (eg. weighted voting instead of a national veto in the Council of Ministers). We can end years of bickering on this point, since this view appears not only to be the prevalent view in the UK, but also in other European countries as shown in the no vote in France and Holland and in polls in countries such as Germany and Poland, and consequently for the time being the issue of further integration is unlikely to arise. Additionally, Conservatives will be in a strong position and can argue to have been proved right on this point. For this reason, I cannot understand the point of Dr. Fox’s saying he wants to “end relations with Europe” and promote Atlanticism in place of this. After 15 years, it appears that we are close to reaching a rough party consensus on the role of the EU (as the Tories have been promoting since 1997) and ending relations with the EU, as Fox is promoting, would simply give Blair an easy opt out in that he could occupy the position which would be vacated by the Tories under Fox, namely maintaining relations without integration. The special relationship will exist independent of the EU and by no means am I saying that this should be stopped. But this is a political relationship. My point was that having burnt bridges with the EU, Dr. Fox’s position could leave us with less manouverability and negotiating power - i.e. no plan B. China and the US in trade terms have proved to be quite keen to export their products and much less keen to importing foreign goods. Otherwise Dr Fox gave a very good speech. I wasn't keen on his comments of a "French view of the world" - sure we like to have a go at the French as much as they like to have a go at the Brits.... but then we aren't Shadow Secretary of State for Foreign Affairs! For someone in such a position it was unwise and simplistic playing to the audience. Are these people's priorities, though? Missing the point? Those few lines weren't the whole of the speech, they were moments targetted at areas of the party. They're also not the pieces I've seen played on the news. They concerned the mentally ill and Iraq. No it isn't. Recently a wide number of people from Trevor Phillips to Gordon Brown have spoken about the need to strengthen the British national identity, and indeed promote it. Which is what flying the symbol of that unity would be intended to do. Are all these people from the "hard right"? For this reason, I cannot understand the point of Dr. Fox’s saying he wants to “end relations with Europe” and promote Atlanticism in place of this. Dr Fox didn't say we should "end relations with Europe." Or indeed anything remotely like that. He said that "We need to lead a Europe that is decentralised, outward looking, and competitive. We need fewer regulations and powers brought back to the nation states. We should be leading New Europe where the Czechs,the Poles, the Baltic states share our view of the world. Many have just shaken off one oppressive foreign regime- why would they want another based in Brussels." Already been hit by the mailing hit. David Davis send me one of the round robins...curious since I never signed up to his site and no other candidate has sent me an email. Is DD the only person with access to the lists of email addresses of Conservatives? James, sorry if I have been duped by the media! Sky News were reporting on a screen caption"to end relations with Europe". James B, what Dr Fox actually advicated was joining with the Eastern European nations to try and reform the EU. The only bit that could be taken to mean "ending relations with Europe" would be an inept spin on ending the policy on ever closer integration. "Already been hit by the mailing hit. David Davis send me one of the round robins...curious since I never signed up to his site and no other candidate has sent me an email. Is DD the only person with access to the lists of email addresses of Conservatives?" I did too and I didn't sign up either. Im guessing he must have access to the lists of those who have signed up to the Conservative Party site. Otherwise he wouldnt know I exist. Ive still got the email in my inbox. I cant have been the only one to have received this round robin. Anyone else rceeived one? Its about the campaign launch. The problem with Liam Fox is that he's too Americanised. All the candidates have problems, of course, and perhaps that should not be the deciding issue, but it's worth keeping in mind. This idea of flying the flag, for example, is just silly. I would love there to be more patriotism in society, but that course of action will not help. Quite possibly, it would be resented, and I can envisage students finding ways of vandalising them. It would be oppressive, anyway. Patriotism is not something that should be brainwashed into people in the American way. Many American 'patriots' are so because it is easy to be patriotic when ones education is so skewed towards America, and I fancy that, when the going got tough, they'd fly in droves. It is my belief that there rests a sense of national pride in most British people, but that the pressures of modern society have caused it to be buried pretty deep. Consider, however, the reaction to the attacks in July. In moments, people were evoking proud memories of the World Wars. The British, people said, are not be cowed or defeated; and even those who did not dare to say something so socially unacceptable felt it. By all means, politicians should wrap themselves in the flag and speak with pride, but they should not, and cannot, force citizens to be patriotic. That can only come from within.